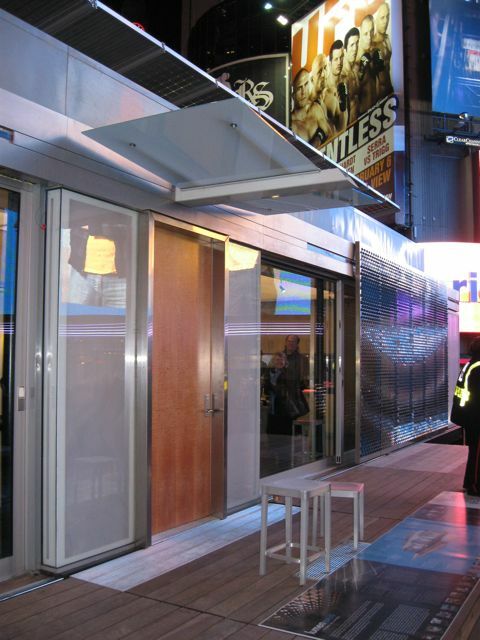 Virginia Tech's entry to the 2009 DOE Solar Decathlon, lumenHAUS, in Times Square. If you can’t make it to the Hafele showroom tonight for the presentation on lumenHAUS—Virginia Tech’s entry to the 2009 DOE Solar Decathlon—don’t worry about it. 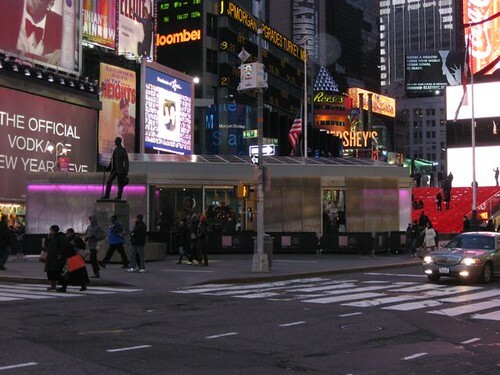 AN was in Times Square last night to get the inside skinny on the solar-powered wonder house. In a quest to reconcile contemporary goals of sustainability with modern architecture, the VT team went beyond solar arrays. They began by studying the Farnsworth House and looking for ways to increase its insulation while maintaining its connection to its surroundings. That inquiry led to the design of a steel-framed glass box outfitted with two layers of sliding panels. The south face of lumenHAUS with its angled solar array and sizable deck. The inner panel is made up of two layers of polyethylene filled with expanded silica gel—a highly insulating material that is lighter than air and translucent. 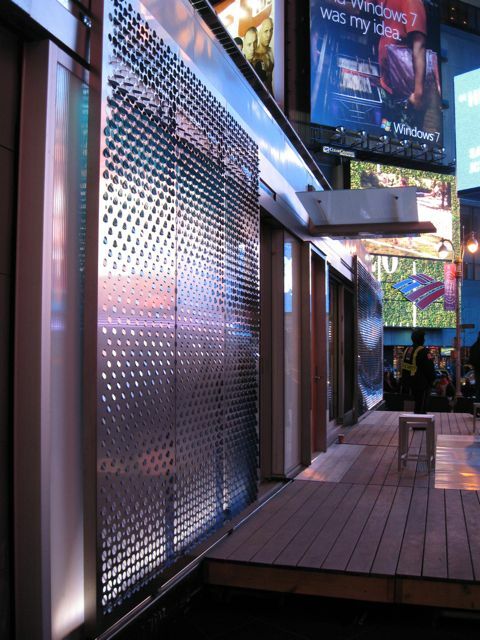 The outer panel is a stainless steel sun and severe weather screen outfitted with perforations to allow some light through. Together with the glass wall these layers deliver an awesome insulation value of R24. LumenHAUS is outfitted with sensors that will adjust the panels to optimize energy usage in the house. At any time, of course, residents can override the system not only from a central control panel and manual switches, but also remotely through an iphone application. The steel and glass structure gets its high thermal performance from two layers of sliding panels that adjust automatically to optimize energy use. The house opens to two decks, one on the north and one on the south, increasing the potential living area during clement weather. Inside, the tiny 600-square-foot layout was planned with space conservation in mind. Various items of furniture move and transform to serve a variety of functions: A high shelf pulls away to reveal the kitchen counter while itself becoming a side table for the dining area. The bedroom’s closets slide aside to reveal the TV and close off that portion of the home for privacy. 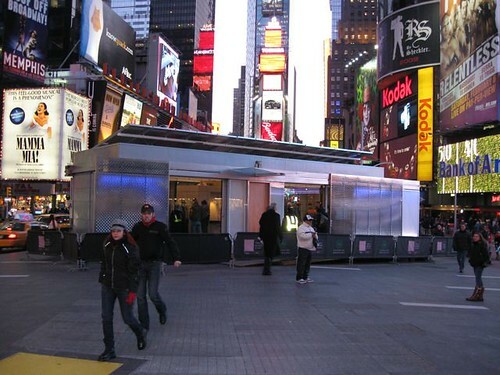 LumenHAUS can be entirely prefabricated and shipped to any site with ease. It sits lightly on the earth on only 8 concrete piers. The lumenHAUS is intended to be a prefabricated living system and modular, so that you can add other pieces on and stack them in a variety of configurations. The house also becomes its own transportation device. Diagonal steel members can be added to the frame making the building a truss, then a wheel assembly pins to a steel member at the rear of the house, and at the front a similar attachment is made to interface with a big rig. Within a matter of minutes the house can be outfitted to move. When it arrives at it site it is lowered onto eight concrete piers, making a minimal impact upon the earth. 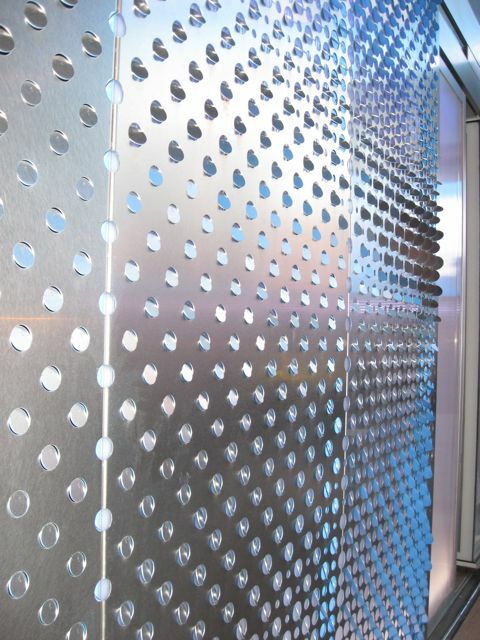 In addition to sun shading, the stainless steel panels can be closed for security or to protect the house from high winds.